My picture. An oil painting. 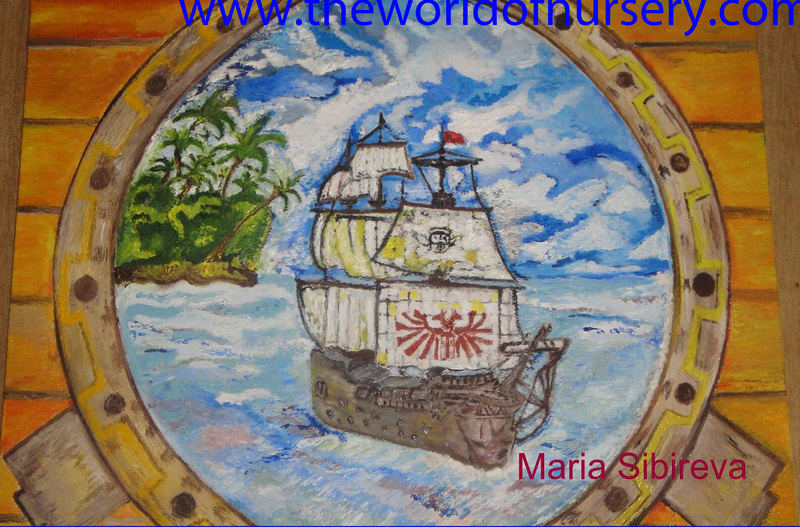 There are more than 240 projects in the Gallery of Imaginative Play and Games. 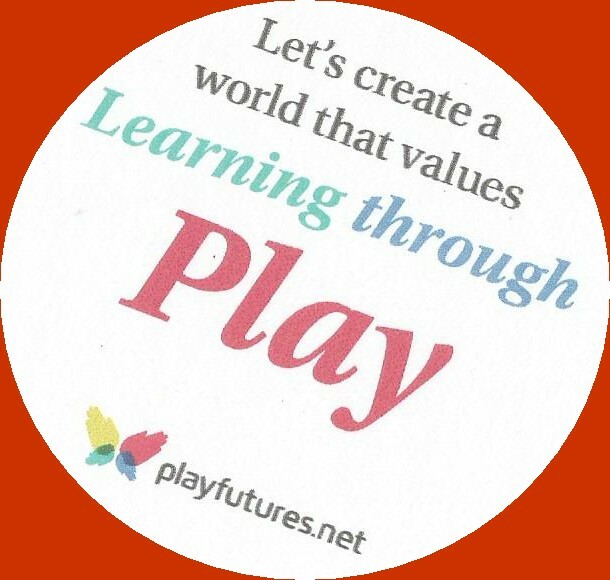 All projects are unique, every project contains new ideas and knowledges, emphasizes how play can be used in the learning and how play is important in the life of the child. 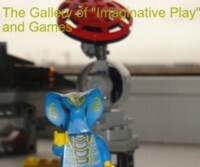 Let me introduce the Fifth Review of the Gallery of Imaginative Play and Games (the projects 187-245). The first four reviews are here. The Gallery is here. 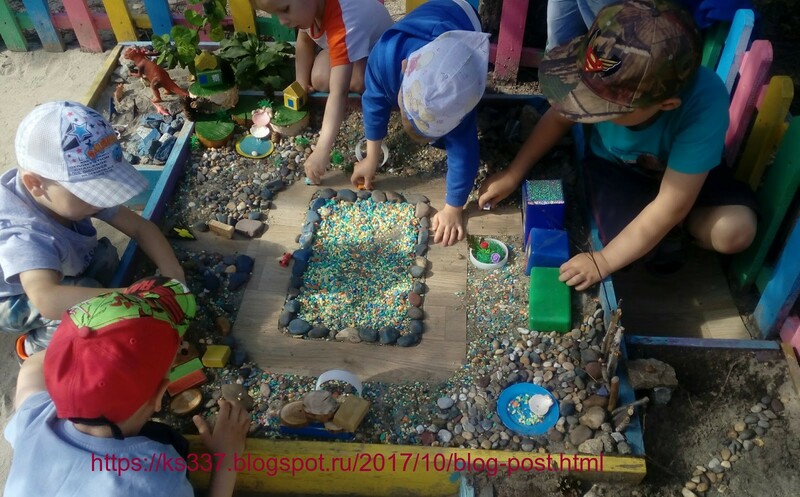 Toliatti, Russia (the blog "Volna") shared the results of the creativity of her pupils: projects 187, 188, 202, 212, 222, 232, 241, 245. Children spent the summer not only with pleasure but also with a favor: you will find handmade crafts from natural material in the following articles -187, 188. Children need an imagination - and simple pebbles turn into amusing animals and objects, the shells turn into the handmade crafts, the haricot and buckwheat turn into an exclusive frame for photos, the plasticine turns into the heroes of the famous animated film, etc. - and the "dishes" from vegetables and fruits - 245. 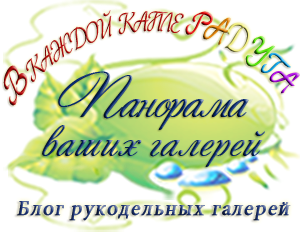 Nadezhda Vladimirovna inspires pupils on the creation of handmade crafts and drawings, she supports children in their aspirations to invent and to create something. 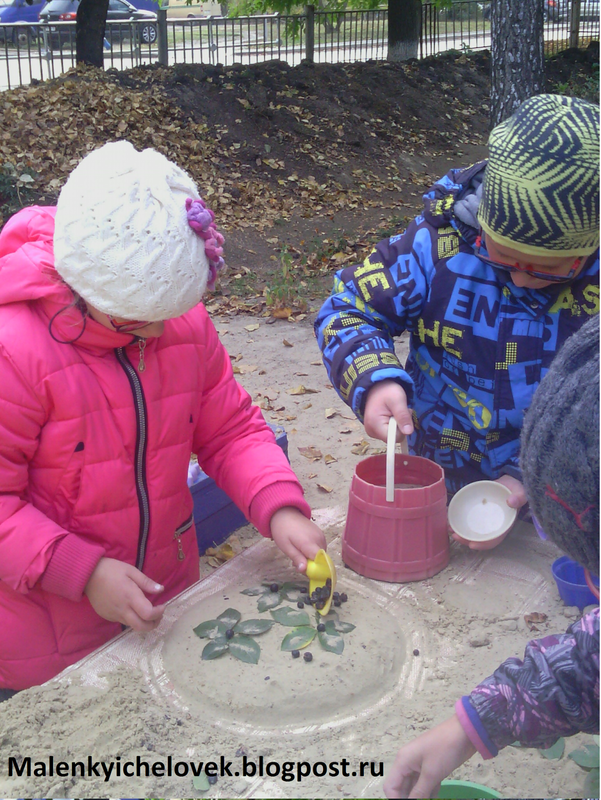 Through unusual tasks, a play in learning is used. Many children feel the lack of play activity, therefore such experience in schools is necessary. 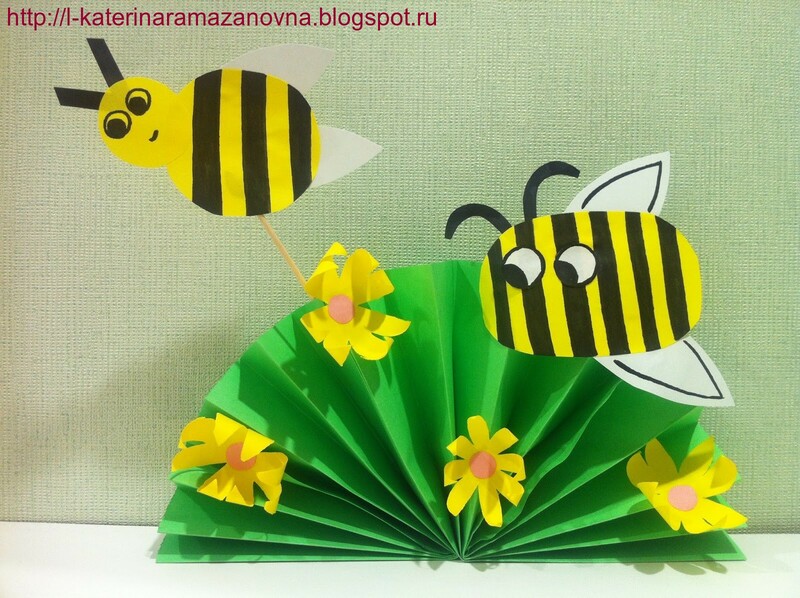 Ekaterina Labutina, Krasnodar, Russia (the blog "Vozrast Vozmozhnostei") told us about a wonderful lesson "A small bee" (189). 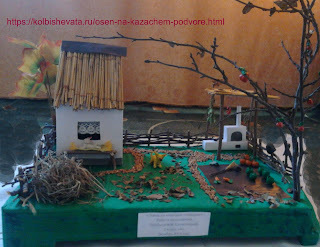 Photo from the blog "Vozrast Vozmochnostei"
Creative activities which include riddles, video, physical activity, etc. help preschool children to understand and remember new information by the means of play. We wait for the new projects of Ekaterina since all her lessons are constructed on the basis of play. Anna, Minsk, Belarus (the blog "Veselie Budni") continues to participate in the Gallery of Imaginative Play and Games (190; 197, 220, 227, 229). Anna wrote how it is possible to create the robots from "trash". Each robot has the functions - the children's imagination is unlimited (190). in the project 231 we can read how children create an autumn landscape from the simple toy cubes. In Anna's family the children actively and with a great pleasure join the offered play and games, invent new games. The socialization through play has the results: sons and Anna's daughter like to draw, to write poems and stories, make videos, etc. It is the result of a constant play activity which is necessary for children. Oksana Stohl, Kemerovo, Russia (the blog of Tsvetik-semitsvetik studio and the blog Belochka) is a permanent participant of the Gallery. In her blogs she writes about the unexpected methods of the drawing and the creation of handmade crafts. These methods make any creativity of children the real play (191; 192; 193; 201). these beautiful birds were also made by children by the means of applique - 193. Plastic forks, crumpled paper, hands in color are necessary attributes for the drawing of hedgehogs in the non-traditional techniques - 201. Drawing becomes cheerful and fascinating! Besides, in the one of the blogs Oksana Vladimirovna told how to make toy mushrooms from the simple material- 239. 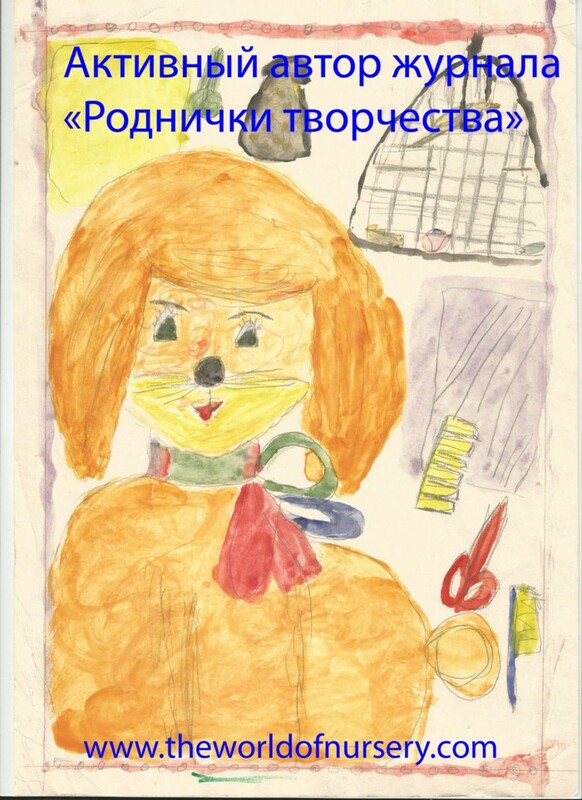 Oksana Stohl always does big preparatory work before children start to do something: different events are discussed, poems are read, the finger-type gymnastics is used, etc. - and children are ready to play and to create. 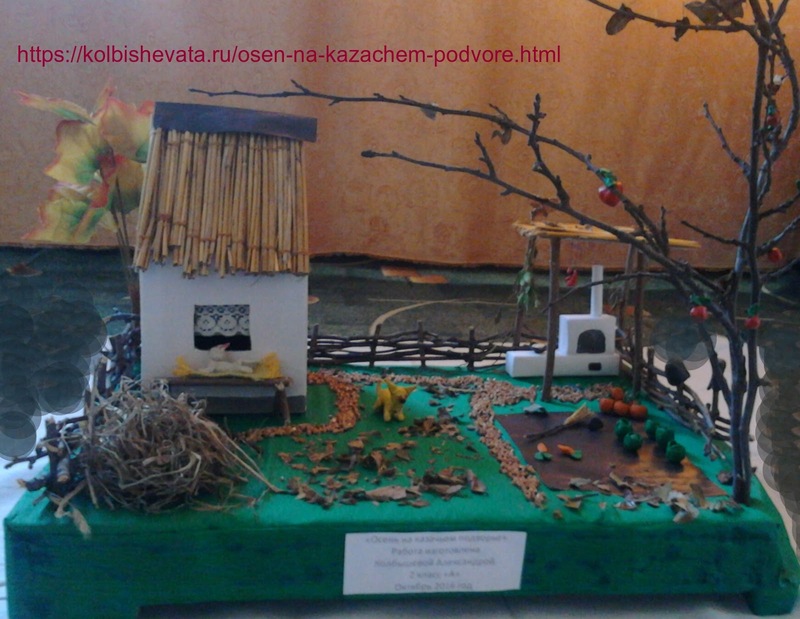 "autumn on the Cossack farmstead" (195) - such crafts allow children to invent something, to invent new details and heroes, to feel the atmosphere of the created object especially if we talk about the historical reconstruction of the life of the native land. 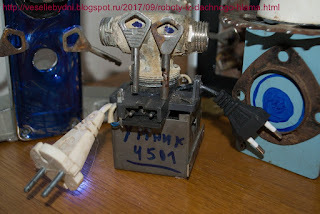 Photo from the blog "Mamini Zametki"
the handmade "lodge for a hedgehog" (235) is executed by Tatyana's son independently and the article about it can be a good master class for many readers. It is necessary to emphasize that projects which Tatyana shared, contain the huge potential for a further play of children and the development of their imagination. described what happens with the insects in the autumn (196) and she also shared several blog posts connected with the biological research activity of children (198, 199, 200, 203, 209, 221, 226, 233). 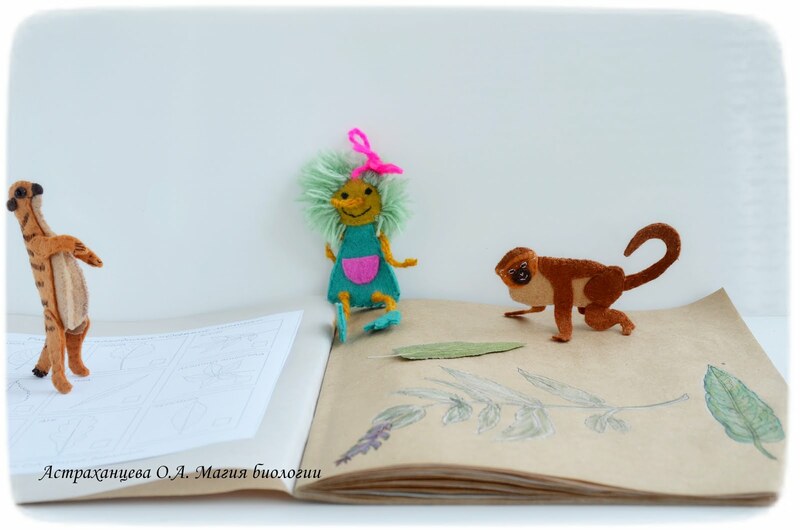 Photo from the blog "Biology Magic"
Olga's assistants are the heroes of the puppet theater which are created by her. They "open" the mystery of nature to children and adults. Besides, they help children to organize correctly research activities, to answer riddles and questions. The beautiful photos by Olga, her poems and questions, detailed reviews of the research walks of children and their parents from the different cities and countries - all this helps to turn biology into fascinating and mysterious science for children. and even about how many games a simple pumpkin can contain - 228. Thanks to the mother Nadezhda, Ksyusha can be a Little Mermaid, to make a lodge for a little squirrel in a magic wonderful tree, to become the heroine of the picture, to use pumpkin in the form of a lodge and a helmet for dolls, etc. Ksyusha already begins to invent new games, to invent adventures for the dolls, etc. And these are the results of the constant play activity. Natalya Guryeva, Chelyabinsk, Russia (the blog "Babochki") shared games and creativity of her pupils (208, 215, 216, 223, 225). and they also imagined autumn in the form of the little amusing girl - 225. 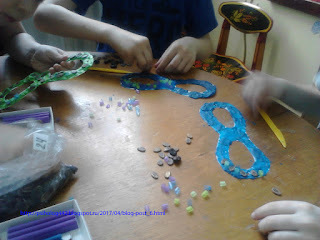 Photo from the blog "Butterflies"
and also children invented the own game connected to vegetables and fruits - 223. In the blog by Natalya Guryeva we can note how support of the tutor in the development of the imagination of children is important. Natalia often directs children's activities, but she provides freedom to the children in the implementation of their intentions. 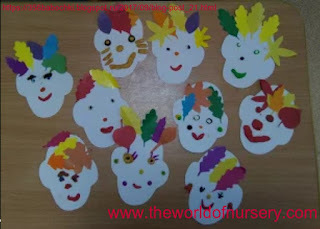 Therefore all preschool children make different portraits, trees, objects - all with the personal characteristics. It would be desirable to mark that such approach is productive, and not only Natalya's pupils in kindergarten, but also her daughter and her nephews are very creative, talented children who like to draw, to make handmade crafts, write stories, etc. Zhanna Shaydarova, Yuzhno-Sakhalinsk, Russia (the blog "Ni minuti pokoya") (210, 211). how children of 2-3 years can get acquainted with the world around and perform creative tasks - 211. Working with the small children, during their adaptation in the kindergarten, it is necessary to know and consider all age features, to carefully fulfill the duties, to appreciate and respect children's creativity. We can notice the fulfilments of these requirements in the every article of Znanna Vitalievna. Here play is combined with learning of children of 2-3 years. told us about the importance of the play with the toy constructor and she demonstrated how children in her group of kindergarten make different objects not only from the constructor, but also natural materials - 217.
the children understand how from simple objects difficult objects can be made, how to make new toys and play. Olga Fedoraeva, Omsk, Russia (the blog by the educational psychologist Olga Fedorayeva) wrote about the games made by her - 219. It would be desirable to mark that Olga Ivanovna is able to create fascinating games from the simple things. She offered games which develop motility, coordination. But children also began to invent their own games, for this purpose the material provided by Olga Ivanovna was necessary. Nadezhda and Yana Borisenko, Glukhov, Ukraine (blog "Dnevnichok Yanochki") decided to join us with an autumn handmade craft - 230, the invented game (236) and droodles (240). Photo from the blog "Dnevnichok Yanochki"
The game "Perform the Task" (236) which is independently invented by Yana combines learning and play. The child suggests the tasks, and the parent can suggest to make something to the son or the daughter: to solve puzzles, to draw a card, etc. Thus it is possible to involve the child even in the cleaning of the room, in reading, etc., because it is a part of a game, but not a duty. spatial thinking, imagination, it seems to me an ideal training for the future artists. 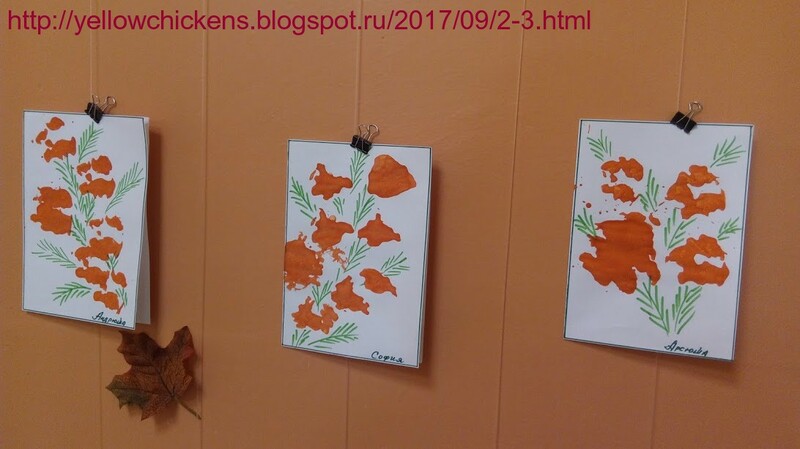 Tatyana Lazareva, Orsk, Russia (blog "Vmeste s Mamoi") joined the Gallery with a handmade craft and the variety of autumn games - 234, 243, 244. 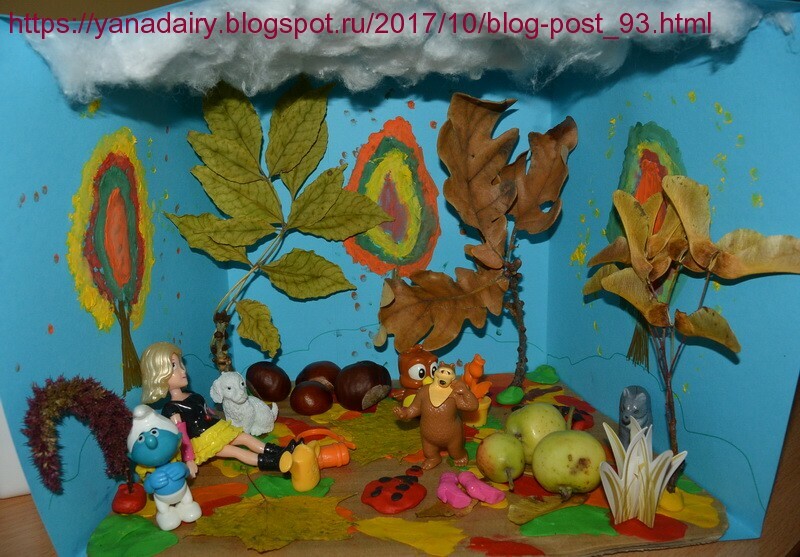 Photo from the Blog "Vmeste s Mamoi"
The daughters of Tatyana made the small toy worlds of plasticine. Gnomes and heroes Kapustka and Morkovks live there. The toys created by children can become one of the most favourite (234). Arina and Katya already distinguish seeds, thanks to the game (244) invented for the Birthday in the "style of Thumbelina". Thanks to such game children become closer to the nature, learn about its features. Their little brother also joined games of girls: for him these are the first steps of knowledge - taste, color, - all this makes an indelible impression (243). Gulfiya Davletshina, Ufa, Bashkortostan (the blog "Vozdushniy Zamok") wrote and shared photos about the "white day" - 237. Drawing by shaving foam, attempt of a molding from soap plasticine - all this is so unusual that intrigues not only children, but also adults. A game becomes fascinating, it is an opportunity to understand where we meet white color in the nature. Elena Ishimova, Chelyabinsk, Russia (the blog "Smeshariki") told about summer games in the kindergarten - 238. The world of dinosaurs, the place for hunters and the lake for elves and the whole residential district were in the kindergarten last summer. Mandalas from stones (the schematic image of something), a mosaic from covers were offered by Elena Valeryevna to preschool children as possible games. 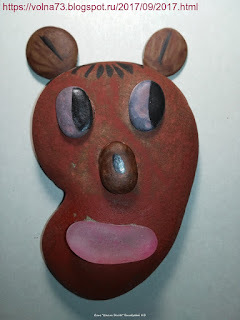 The special attention is deserved by the game "Stories on Stones" - when children composed the stories. All listed games not only entertain children, but also help them to invent something new, to imagine, to play, to gain new knowledge. Yulia Zueva, Chelyabinsk, Russia (a page of the psychologist Yulia Zueva) sent a post how she with the children made masks of superheroes - 242. Similar games cause indescribable delight of children since they support the part of the subculture of the childhood. Finishing the short review, I suggest you to get acquainted closer with the creative projects of the participants of the Gallery of Imaginative Play and Games. I woul like to remind that from September 15th to November 15th 2017 the participants of the"Gallery of Imaginative Play and Games" can take part in the challenge!